A canal from the Nile originally led to the temple. Only a trace of the canal, dry now for millennia, can be seen. 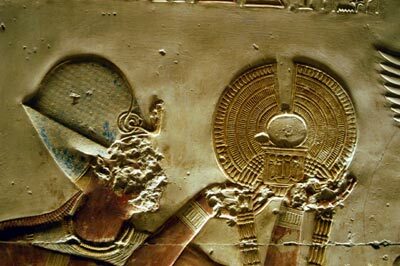 While the complex here is ruinous, the temple of Seti itself is in good condition. The Osireion, a cenotaph or false tomb, lies adjacent to the limestone temple of Seti I. It was the cult center for Osiris, the God of the Dead. According to legend, his body was buried at the site (or, perhaps, only his head). 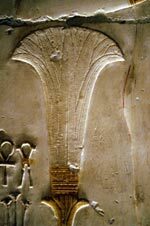 Early religious belief required that pharaohs be buried in Abydos in order to achieve the afterlife -- which accounts for the many pre-dynastic and old kingdom pharaohs buried in the necropolis here. 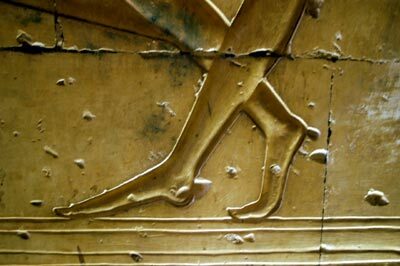 The tomb of Menes, the founder of Egypt, and other 1st Dynasty kings have been found, as well as ritual burials of many later pharaohs.